In a Christmas bonanza to the common man, the GST Council Saturday reduced tax rates on 23 goods and services, including movie tickets, TV and monitor screens and power banks, and exempted frozen and preserved vegetables from the levy. 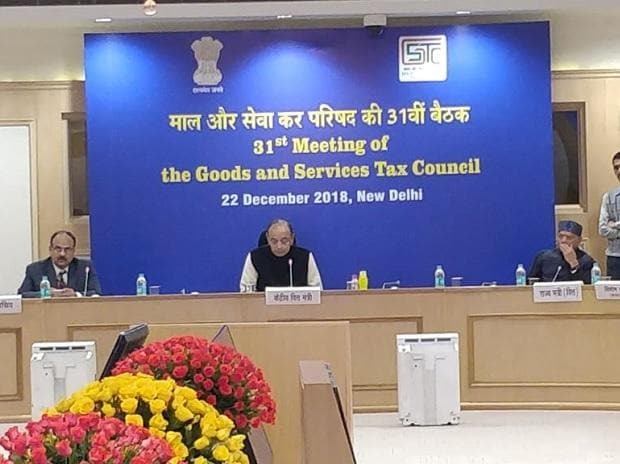 The reduced rates are likely to come into effect from January 1, 2019, Finance Minister Arun Jaitley told reporters after the 31st meeting of Goods and Services Tax (GST) Council here. The goods on which GST has been lowered to 18 per cent from 28 per cent at present include pulleys, transmission shafts and cranks, gear boxes, retreated or used tyres, power banks of lithium ion batteries, digital cameras, video camera recorders and video game consoles. The 28 per cent slab is now restricted to only luxury and sin goods apart from auto-parts and cement - the tax rate on which could not be cut due to high revenue implication. "Rate rationalisation is an ongoing process. When the original rates were fixed, India had the most irrational taxation rates. Most of these items were charged, along with cascading effect, at 31 per cent. So we had only transiently put them at 28 per cent, because if we had immediately brought it down then the revenue impact would have been there and therefore the social expenditure of central and state governments would have suffered. Apart from luxury and sin goods, mass use item cement and white goods like air conditioners and dishwashers are left in the 28 per cent slab. "The next target will be rate rationalisation in cement as and when affordability improves, Jaitley said, adding reducing GST on cement would have cost an annual Rs 130 billion to the exchequer. The annual revenue implication of the rate cuts would be Rs 55 billion, he said. GST on movie tickets costing up to Rs 100 cut to 12 per cent, from 18 per cent, tickets over Rs 100 to attract 18 per cent GST, against 28 per cent earlier. This will have annual revenue implication of Rs 9 billion. Monitors and TV screens up to 32 inches and power banks will attract 18 per cent GST, as against 28 per cent earlier. The annual revenue loss on account of this would be Rs 15 billion. The rate rationalisation comes after Prime Minister Narendra Modi on Tuesday indicated that the 28 per cent slab of GST would only be restricted to a few select items, such as luxury and sin goods and said his government wants to ensure that '99 per cent items attract 18 per cent or lower GST. The other items which will now attract 18 per cent tax include pulleys, transmission shafts and cranks, gear boxes, retreated or used tyres, power banks of lithium ion batteries, digital cameras, video camera recorders and video game consoles. These items currently attract 28 per cent rate. The GST Council has also decided to slash tax rate on parts and accessories for the carriages for disabled persons from 28 per cent to 5 per cent. Also third party insurance premium of goods carrying vehicles has been reduced from 18 per cent to 12 per cent. The other items will attract lower GST rate of 5 per cent include marble rubble, natural cork, walking stick, fly ash blocks. Music books and vegetables (uncooked or cooked by steaming or boiling in water), frozen, branded and put in an unit container and vegetables provisionally preserved but unsuitable in that state for immediate consumption have been exempted from GST. Services supplied by banks to Basic Savings Bank Deposit account holders under the Jan Dhan Yojana will not attract GST. Air travel of pilgrims by non-scheduled/charter operations being facilitated by the government under bilateral arrangements will attract a lower GST rate of 5 per cent. The Council has decided that 5 per cent would be levied on renewable energy devices and parts for their manufacture. When asked about his message to the industry to pass on the rate cut benefits, Jaitley said, "There is already anti-profiteering authority, which has been more than active. Of course, they have to pass on the rate benefits. Or we will do what we did in case of restaurants". Jaitley further said that the Council has decided that businesses which are supposed to pay GST and file returns but have not done so far, should file it by March 31, 2019, to avoid penalty. Revenue Secretary Ajay Bhushan Pandey said that the new return filing system will be launched on trial basis from April 2019 and would be made mandatory from July 1, 2019. The GST Council has also decided to set up a centralised Authority for Advance Ruling to hear those cases in which two divergent verdicts have been passed by AARs of two different states.